The Citizen Journalism Educational Trust (CJET) inspires and encourages the personal development of young people through journalism, writing, literacy and improving their communication skills. It was launched in March 2009 and is a charity registered with the UK Charity Commission. Its number is 1137691. 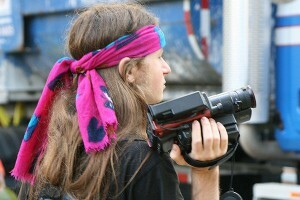 Community-based journalism is used by the trust as a powerful vehicle for furthering the personal and social development of young people in hard to reach, non-traditional communities by giving them the ability to think critically about the world and express their ideas in a clear and collaborative way. Practicing journalism requires them to engage in the civic life of their communities. Among its activities, CJET helps train and resource young people who the UK government refers to as NEETS (not in education, employment or training) who would like to become citizen reporters but who previously, because of their own financial circumstances or lack of education, were unable to gain access to a career in writing, photography or video. It produces educational material that includes college standard online out-reach materials and tutorials for contributors interested in a career in journalism, photography, filmmaking or broadcasting. The charity also aims to assist the public to find a better connection with the sometimes mystifying world of media, journalism and current affairs that is so influential in all of our lives. A report by The Work Foundation identified many areas in the UK where NEET rates among young people was exceptionally high and where public sector cuts meant that youth services and 16-19 education faced reductions of around 20 percent. In Camberwell and Peckham constituency, south London, the number of young people looking for work for more than six months was up 85 percent since January 2012. This dramatic increase in youth unemployment is particularly worrying after the area was badly affected by the English riots in August of 2011. It is this type of social inequality affecting young people that CJET is striving to deal with. CJET has partnered with The-Latest.Com, Britain’s first dedicated citizen journalism news portal, in some of its projects as well as the multi-award winning Guardian newspaper, leading young people’s charity Kids Company, Morley College, the London College of Communications, the Migrants Resource Centre, Media Diversity Institute and the London Borough of Southwark. The trust has formed productive relationships with a number of news media, trade unions and academic institutions including the BBC, Sky News, Guardian News & Media, Media Trust, Time Out, the South London Press, the Big Issue, City University, the University of Lincoln, University of Leicester, Durham University, Goldsmiths College and South Bank University. CJET is always keen to work with similar organisations in the furtherance of its key goals. It has received funding and support from organisations including Media Trust, The BBC College of Journalism, Trust for London, Unite, branches of the National Union of Journalists, Southwark National Union of Teachers, the University and College Union, Metropolitan Housing Trust and Midas Charity Appeals.